Goose Feet Cookies? What a strange name, pronounced in Russian ‘Gusinie Lapki’. The name comes from the triangle shaped cookie which looks like a webbed goose foot, if you squint really hard. The name flows much better in Russian! You can get creative with the design and use a fork to press indentations on the cookie for more detail, but I’m keeping it simple. Goose’s Feet Cookies are really easy and fun cookies to bake, and go perfectly with a cup of tea or coffee, plus they have a crazy name. What’s not to love? This delicious recipe is so simple with only 5 ingredients, with only 2 steps until you’re rolling out the dough! Some recipes are more complex and might require cutting in cold butter or other complications, but this one is super easy and delicious. Can I Make Farmer’s Cheese? Tvorog, Quark or Farmer’s Cheese is a fresh cheese that can be bought in store, but can also be easy to make. For a really quick and easy shortcut recipe to make tvorog click here – Easy Tvorog Recipe. But in case you don’t have Tvorog or don’t want to make it using the shortcut recipe, you can substitute with Cottage Cheese. Remember to squeeze out the cottage cheese from excess liquid, or see note below about adding extra flour. Russians find so many uses for tvorog as it is to Russians what mozzarella is to Italians. You can add some lemon zest or vanilla to the recipe, or even mix half-half raw sugar and white sugar just to change it up a bit. 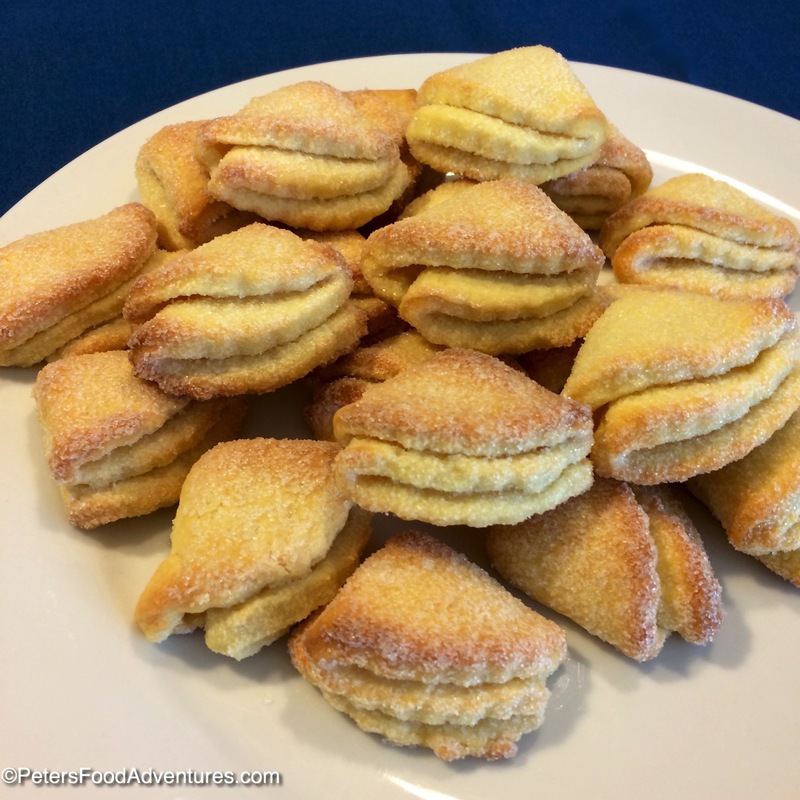 These Cottage Cheese Cookies or Goose’s Feet Cookies are a delicious cookie to have with a cup of tea or glass of milk. The problem is, as I bake them, the kids keep eating them! Bon Appetit! Приятного аппетита! Update July 2018: This recipe has always worked for me with 1 cup of flour, as you can see from the photos. The tvorog I use is quite dry. 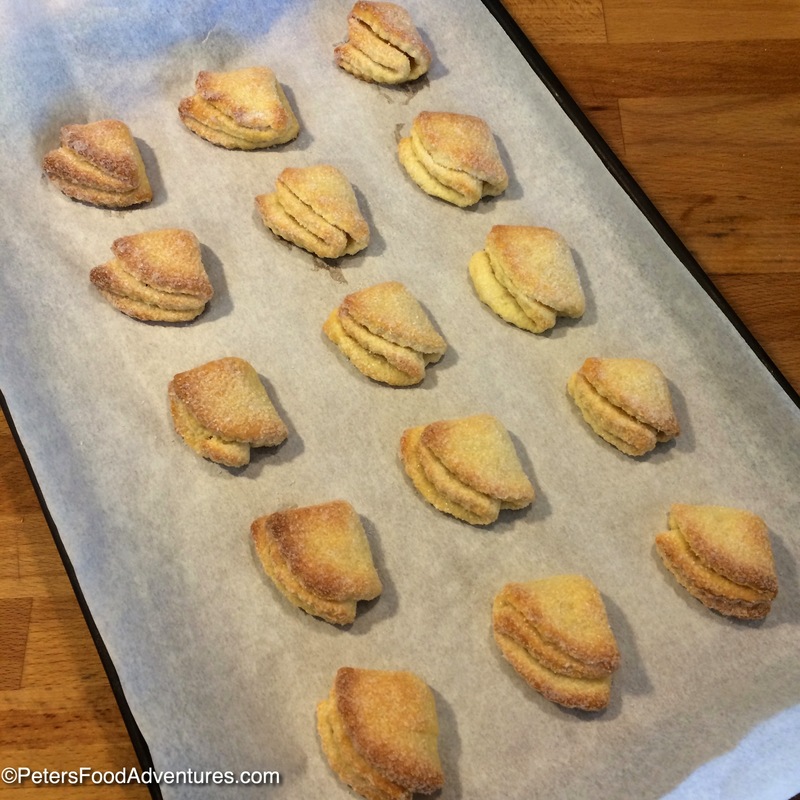 I got feedback from a reader that they used 2 cups of flour which worked better for them. Adjust flour if necessary. Using a hand mixer, beat butter and tvorog until smooth. Using a wooden spoon, mix in the flour and baking powder with the butter mixture until it's soft and tender. The dough should not stick to your hands and will be very soft. Add more flour to the dough if necessary as you work it all together. You can refrigerate for a few hours to firm up the dough, as it is soft, but I'm impatient and just start right away! 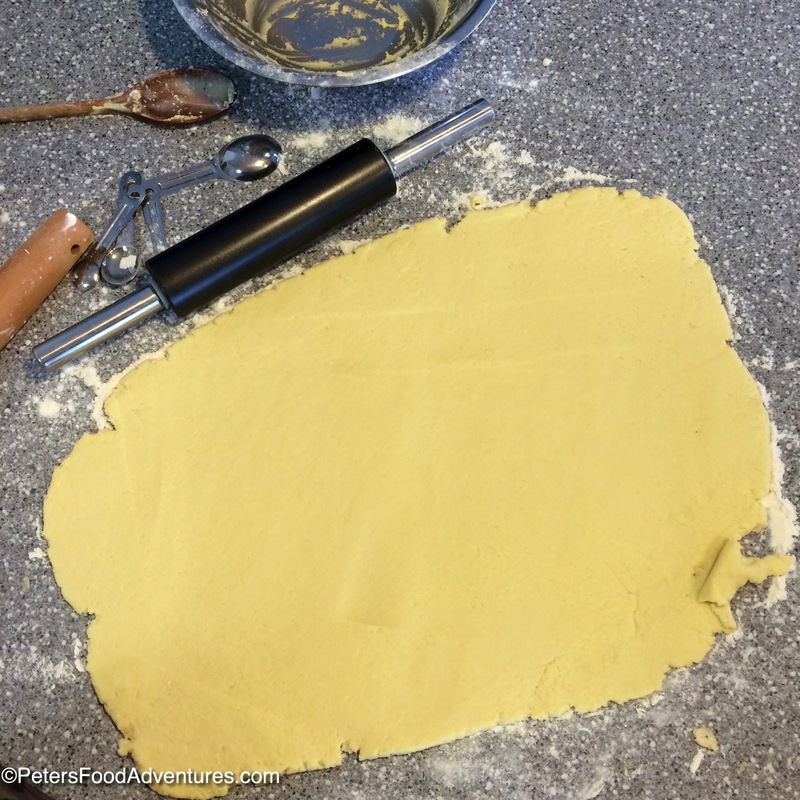 On a lightly floured surface, roll out the dough approx 1/4" thick. Cut out round circles from the dough. 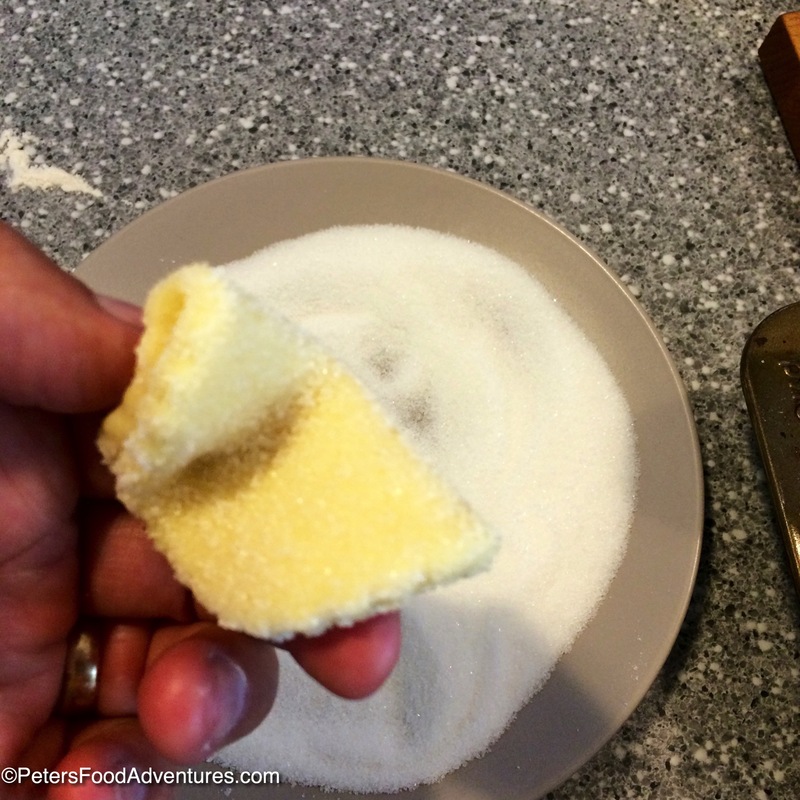 Put sugar on a plate and press only one side of the circle into the sugar. Press firmly so the sugar sticks to the dough, then fold circle in half. The sugar will always be folded together, inside of cookie, leaving the outside you are handling sugar free. You now have a semi-circle piece of dough. Press firmly one side into the sugar and again fold the sugar into itself. You now have a quarter circle. 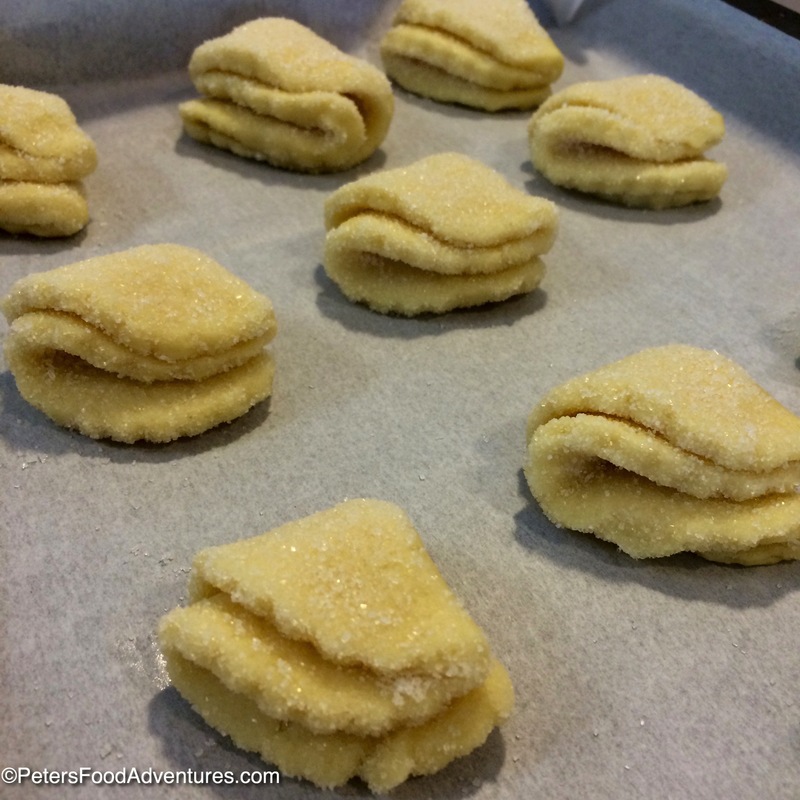 Press one side into the sugar and place the sugar side facing up on a baking sheet lined with parchment paper. Bake for about 15 minutes at 180°C/350°F until they are puffed up and golden brown. These cookies sound delicious, and I love the name!! My daughters would love to make these!! Adorable! I can definitely see where they get their name. Thanks for stopping by Julie 🙂 They’re delicious as they are cute too! These are gorgeous just to look at, Peter! I must pin this to my Christmas cookie list! Lovely! OMG!!! These were awesome!! (Even with my Tvorog cheese mishap-see thst recipes comments) I added 1 tsp of dry orange zest, 1/2 tsp of dry lemon zest, and 1/2 tsp of cardamon to the cheese/butter mixture. Its akin to a soft chewy shortbread cookie. Very buttery! Melts in your mouth. Not too sweet, so these would be great as a tea cookie, or bridal shower treat. Awesome! So glad they worked! The zest and cardamom sounds like a great addition. Now you got me wanting to make some! First of all, love the name! Can’t wait to try making them. My grandmother was from Russia and used to make some cookies that my mom used to always talk about. They were cut like ribbons, then deep-fried. She didn’t remember what they were called. I always wanted to make them for her while she was still alive, unfortunately, that never happened. Does that description ring a bell with you? I’m still on a mission to find that recipe and make them in her honor. Great site!